The New Schertz YMCA Pool is Open! Grab your trunks and towel, the pool is open! I know the people of Schertz have been waiting a LONG time for this day to arrive! I’m so excited for this new facility and for all the wonderful benefits it will offer our expanding community. 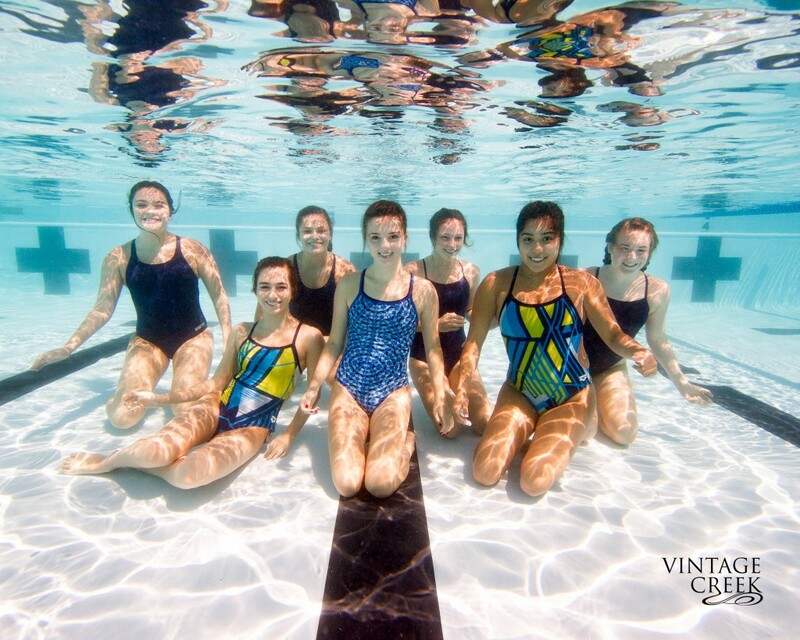 Vintage Creek Photography had the special privilege of using the pool before it was officially open in order to shoot some great promotional photographs! Not only were we allowed special access, we had some amazing models, businesses, and parents to help us with this exciting new project. First, I’d like to take a moment and talk about our amazing models. Introducing: Alyse Voos, Courtney Ayers, and Robert Dziergowski! These three young Clemens Buffs went all out for this shoot. Now you may look at these images and think they might not look very challenging. However, anyone who has done an underwater photoshoot knows otherwise. These projects require courage and endurance. Even experienced swimmers struggle under the pressure. Moving underwater in a full outfit is bulky and awkward. This is especially so when that outfit includes a genuine leather and wool letterman jacket. Courtney was chosen to wear the jacket and thus was tasked with the most difficult aspect of the shoot. The jacket absorbed a TON of water which added pounds of unfamiliar weight she had to swim with and model through. We made sure to take breaks often with that in mind. What really was impressive was, despite the strain of the jacket, Courtney’s facial expression underwater shows no sign of stress. She pushed through and made the task look effortless for the camera. Our project wouldn’t be complete without the hard work of Aly and Robert. These two crazy kids were hilarious. Despite the watery challenges they had to meet, they still kept the photoshoot fun with jokes and plenty of laughter. Their photos really captured that feeling of a red carpet pool party. The clothing we chose for them was a bit easier to swim in, but we still made sure to watch everyone carefully. I had my trusty assistant Becky in the pool as well as a lifeguard on deck. Safety is always a priority with these formidable shoots, so I always aim to be over-prepared. The new Schertz pool is beautiful. The design and layout of the facility is thoughtful and a work of art in itself. One of the biggest factors that contribute to the quality of an underwater photo is the clarity of the pool, and this pool was immaculate! It is the clearest pool I have ever shot in, and all pools from now on will be compared to its perfect clarity. The Schertz YMCA has done a commendable job running and maintaining the city pools, and this one is no exception. I want to give a special shoutout to Aquatics Director Deseret for helping us with this project. It takes a lot of hands to make a photo shoot like this run, and I am thankful for every one of them! I can’t wait to see what the rest of 2017 brings, but if this first project gives us any indication then we are in for a busy year! Please feel free to contact me with any projects you might have or to schedule your own personal land or underwater photoshoot. Underwater Swim Team Photo Tips! Finally! Underwater photos that make sense! So a few weeks ago I had the opportunity to do some underwater swim team photos for my local high schools. I say high schools, as in plural, because I sit smack dab in between the two of them. Both schools are only two miles away from each other. Because of the close proximity and city scheduling, the Clemens Buffalos and Steele Knights swim teams practice together. So my underwater team photo marathon was scheduled. Now before I go off on this impressive feat, I want to acknowledge all the work that was put into planning this day. First off, I would not suggest any photographer to accept this challenge without full confidence in both their team photo experience and underwater experience. 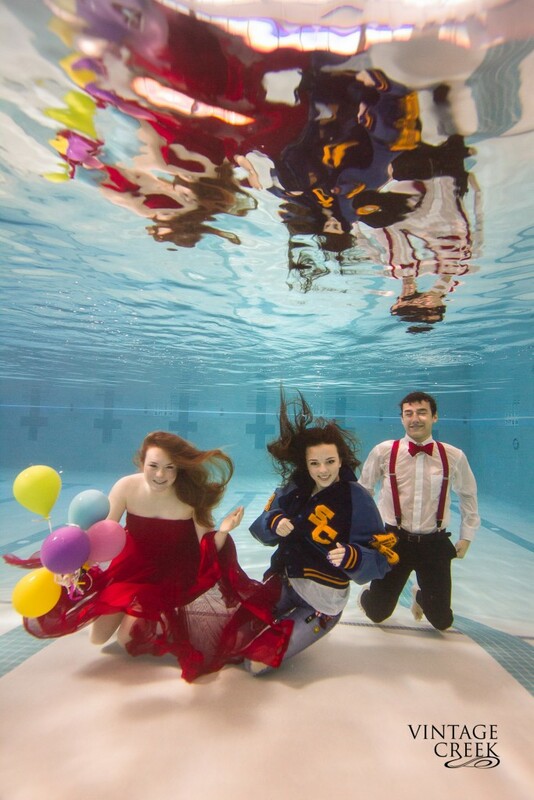 I have extensive experience now in both, but underwater team photos is very advanced photography, and I am not afraid to admit that this was a huge collective challenge. 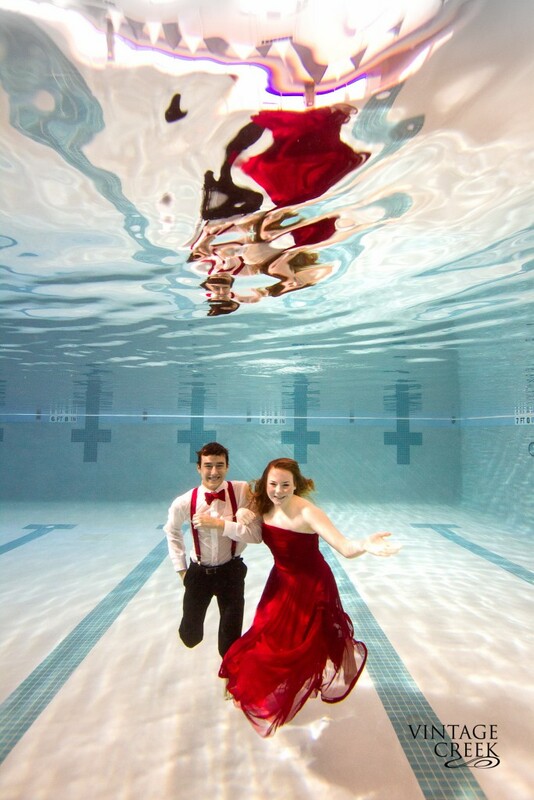 This particular shoot offered individual portraits and team underwater pictures. That means I had a photographer and assistant on land, and a photographer and assistant in the pool. The portraits included studio settings with lights, backdrop, and voluntary props. I also had impressive cooperation from volunteers, coaches, and parents. This was a major project, and I am thankful for all the help I had and recognize how lucky I am that everything went so smoothly. If you consider yourself ready for a similar underwater undertaking, I have several tips that will be invaluable to your success. My largest group consisted of 10 girls. Yes, I said 10! It’s difficult to get 10 people to look at the camera on land let alone underwater. Some were better at holding their breath and some were better at staying at the bottom of the pool. Figuring out each girl’s strength became very important to factor in when placing the swimmers into a formation. The smaller the group, the better I was able to adjust to each of their abilities. If you can, shoot for five – Seven per group. At minimum. Once you educate everyone with the basics of underwater posing, run a couple test shots, figure out each swimmer’s strengths and rearrange accordingly, then really begin shooting- you have already gone through 15 minutes of photo-taking time. Smaller groups work more efficiently, so sometimes you might have time to get creative with posing. But larger groups can easily use the full 30 minutes and then some. No matter your physique, human beings just tend to float. This is something I have learned to work through when I am one on one in a senior photo shoot. With seven people floating around, you need immediate results. Dive weights are an underwater model’s best friend. Just a couple extra pounds held in one hand can make a huge difference in the swimmer’s capacity to stay in formation, and allow them to focus on other posing aspects besides just staying under. Ok so this is mostly for the girls. We asked everyone to come ready for individual pictures that we would take on land before they got in the pool. This meant some of the girls took time to do their hair. No problem, it looks beautiful, but before I would allow them to get in the pool I made them all do a side braid. I didn’t want any hair from a girl in the front row to block someone in the back row. However, I also wanted to make sure that you could see they had hair (what’s underwater photography without beautiful, wafting hair?). A side braid was perfect. But be prepared to deal with braids in front of faces. This is something that applies to all underwater photoshoots, but I still seem to be struggling perfecting this art. For our 6-hour pool adventure, I applied sunscreen twice. That means down all the parts in my hair and to the ends of all my limbs. But I still forgot somewhere. Even your lips need sunscreen, and the sunburn I got from this has cemented this tip in my mind forever. Wear and reapply your sunscreen!! This was my biggest struggle, and the lesson I will keep in mind for every shoot after. I knew I would be working with a lot of people. Each swim team had over 30 members. The kids were excited, and wanted to get creative with their poses. Some wanted quick individuals underwater, then maybe add a friend or two. Normally all of these things are awesome. Creativity, willing-models, networking. But the challenge was so huge to begin with, you need to remember what the end goal is: Awesome team photos. Adding more options risks the priority. Adding can be an option, but only with necessary preparation. Do not throw anything in day of, it just doesn’t work. I have to give a HUGE shout out to my swim team mom extraordinaire Michaelle Voos! She was amazing at keeping the parents informed as well as helping the kids be where they needed to be. Thank you! 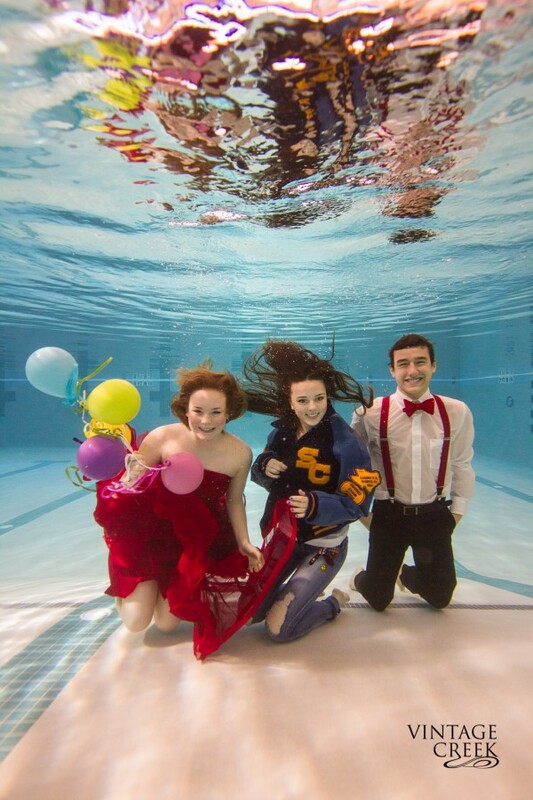 If you would like to schedule your own underwater session or your swim team’s custom photos feel free to contact us. 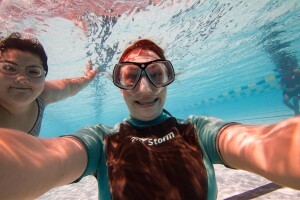 To add a little extra fun to the day, I decided that I would give away a FREE underwater session to one of the swimmers. All they had to do was create a social media post and tag Vintage Creek Photography in it. I was overjoyed by all the responses I got. 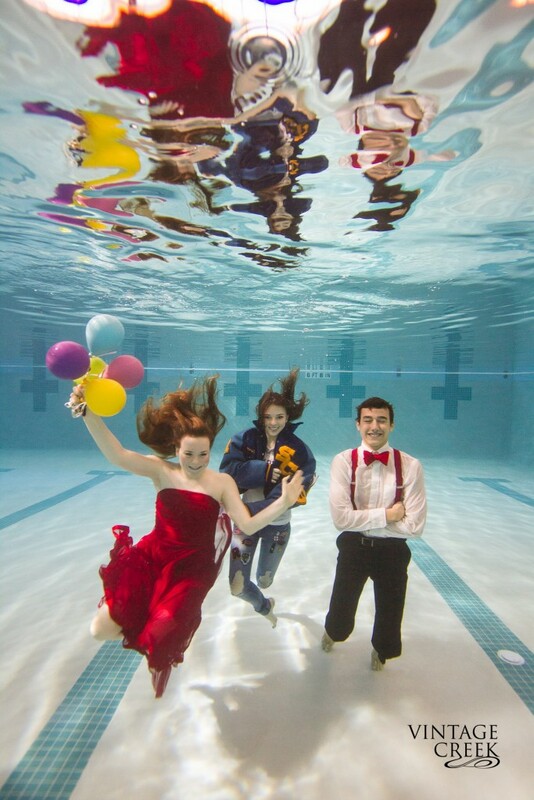 And the winner of the Free Underwater Portrait Session is….. Sydney Fischer! Congratulations! I can’t wait to get this Clemens student in the pool! Please check back in a few weeks to see just how the images of these athletes rank up! Just as a teaser, here is an image I got to squeeze in between sessions. If you want your own private underwater session contact me today. I’m Speaking at PhotoGenesis 2016! 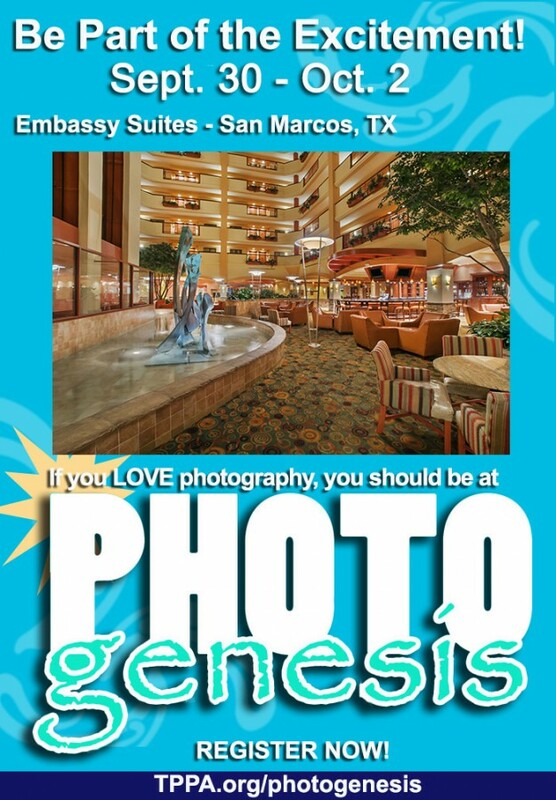 Vintage Creek Photography is speaking at PhotoGenesis 2016! I can’t tell you how excited I am for this awesome opportunity. I am going to be speaking at the walk-up workshop on Saturday, October 1st and Sunday, October 2 from 12-12:40pm, about the liquid world of underwater portrait photography. This will be an in-depth look at what it takes to photograph underwater. We’ll talk about everything from dresses to make-up, camera gear to props and even show you some live editing tips. Whether you use an iPhone, GoPro or your DSLR underwater we have tips for you! I find this to be a huge source of joy in my life to be able to share my knowledge to other photographers. I LOVE going to conventions for the same reason. To learn and hear from the best photographers in the industry is a rare opportunity. For me this is just like getting star struck when meeting a famous actor, I get that way meeting a photographer that I’ve been following for years. (I’m kind of really looking forward to meeting Amanda Holloway…I’m a HUGE fan of her senior work). So for the chance to share what I know is an honor. If you have never been to any TPPA event, then THIS is the one to go too! Located in San Marcos this year, this is an easy drive from either San Antonio or Austin. These smaller conventions are the best way to get you out of your photography rut and kick start your business into high gear. I learn so much from all the amazing photographers that attend and it’s the perfect place to meet other photographers in your area. You get almost one-on-one guidance that you don’t find at the national conventions. If you haven’t signed up I highly encourage you to do so. I can guarantee it’s worth every penny. I hope that you will come and watch my presentation and seek me out if you have questions. See y’all there! Love my new home town of Schertz, TX! 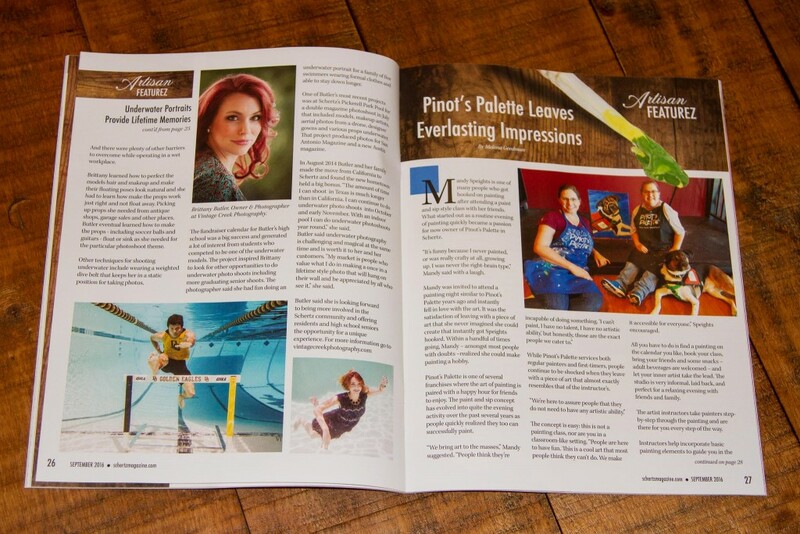 Vintage Creek photography has been featured in the September issue of Schertz Magazine! (Click HERE if you want to read the full article) The past few weeks have been so crazy and wonderful. With each new project I meet some of the nicest people. Sometimes it’s hard to talk about yourself when asked, but It’s not so hard when it involves something that you love. 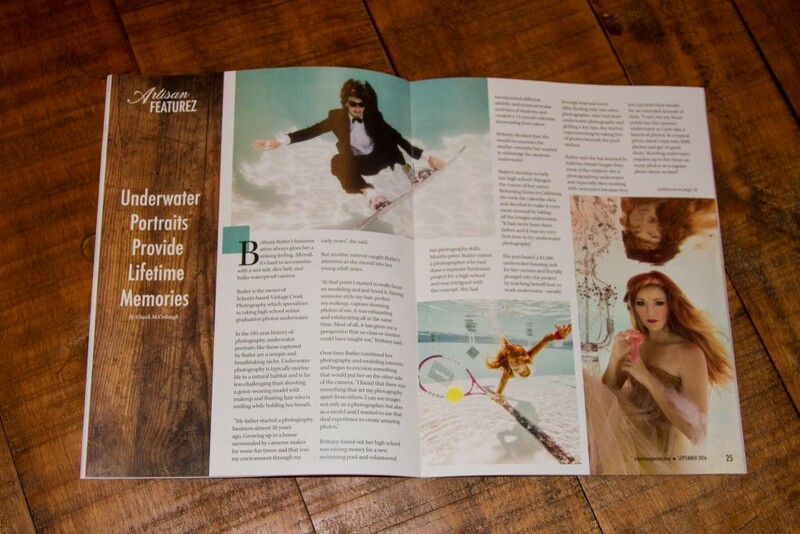 Schertz magazine contacted me because of the underwater editorial shoot we did in July. Meeting with the Schertz magazine staff to talk about my photography business was something straight out of a movie. There I am, sitting at a coffee shop with a reporter, a tape recorder held at the ready. It was picturesque. Chuck McCollough, who wrote the article, was easy to talk to and I could tell he loved his community. Each day I’m learning that Texas pride is not just a cliché, but a way of life. Texans really care about each other and where they live. Just talk to any Texan and you’ll start to feel it too. The Schertz Family YMCA has been beyond helpful as well. Not only was the swim director, Deseret, willing to go above and beyond to help me in my time of need (try finding a 7ft+ deep white bottom pool last minute), but she also was hilarious! We also had two life guards there all day to keep us safe. I couldn’t let them go home without a souvenir photo. Every time I get in to the water, I’m challenged in new ways. I’m stressed, I’m hungry, and I’m so very tired. But being in a supportive community and working with such caring people just makes me want to work harder. I don’t want you to have just any underwater photos, I want to give you the BEST underwater photos. I don’t want you to get the idea that this a solo gig either, it’s really a family effort. Not only do I get amazing support from my husband, I get it from my parents and other relatives as well. Day in and Day out they are there to help with large and small tasks. Not very often do you get to see photo’s of me underwater, so here’s a selfie! My sister in law is an AMAZING assistant and I really can’t do it with out her help. Thanks Becky! I’m loving my new community and the support they are offering me. I am looking forward to the ways I can share some of that love back. Little by little, Vintage Creek is getting bigger and bigger. All with the help of my new Schertz friends. Feel free to contact me about any projects you might have in mind. Wow, can I just start by saying how excited I am for this magazine article to come out! It’s been a whirlwind adventure. We went from concept to print in like 2.5 seconds. I thought I would write a little blog post about how this article came about. I was contacted my Amanda McManus. She saw my underwater work and asked to collaborate on a project she had in mind. Amanda is an amazing make-up artist as well as fashion writer. We were in the very beginning stages of prepping for this underwater photoshoot, when she was contacted by another magazine to write an additional article. Since we were already going to be using the pool, we figured why not do two photoshoots at once. This is where the crazy started, we had one day, a crazy short dead line, two separate models for two different magazines. Plus we had to coordinate tons of props. 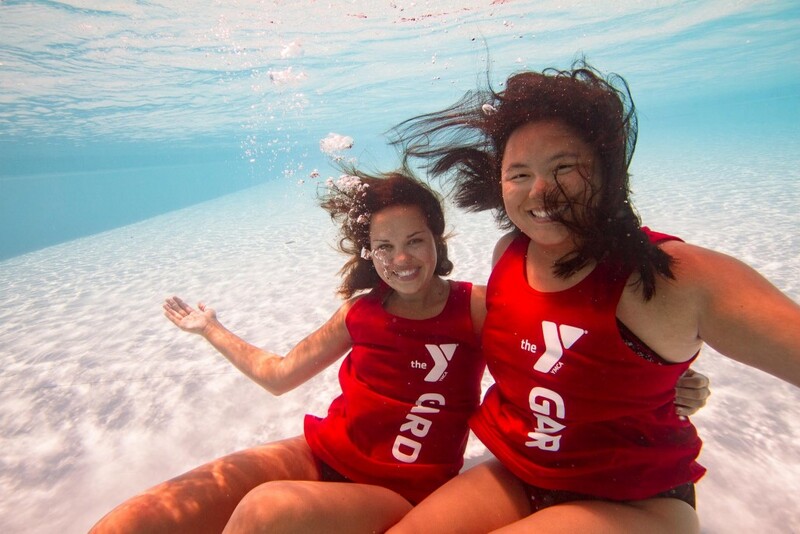 Fortunately, we were able to enlist the help of several assistants to make this underwater photoshoot happen. This first article is a bio on Fitness model Shawn Kraft for a new magazine located in Austin, TX called Hashtag American Mag. He was awesome in the pool and so fun to work with. I can’t wait until the other articles come out so that I can share them with you as well. Here are a few images from the shoot. We had a LONG day in the pool. I got in the water at 11 am and didn’t get out until 4 pm! But it was all worth it. This is is one of my favorite images that didn’t make the magazine cut. We had such a fun time playing around in the pool and coming up with crazy poses to try. Love the open white shirt and watch. We couldn’t have done this without the help of the Schertz Family YMCA for use of the Pickrell Pool in Schertz, TX. As well as the help from the talented lifeguards on duty! This is just the first of three articles that will be published in the next few weeks. I can’t wait to show you what’s coming next! If you’re interested in any commercial work of your own feel free to contact us!